Ah . . . Jiro-kei. I'm sorry, this is actually Jiro-insupaia-kei. I don't understand the details of the difference, but apparently there is one between Jiro-style and Jiro inspired-style. Regardless of nomenclature, this is a mega-popular shop. The second brand of nearby Itto, Toro (燈郎) is a play on the Japanese characters from Itto (一燈) and Jiro (二郎). Get what they did there? The relatively new shop has been accepted by just about everyone in the know. I'm admittedly not a fan of Jiro, or Jiro-kei, or Jiro-insupai-kei, but this one worked for me, thanks to some of the best pork east of the Tama river. 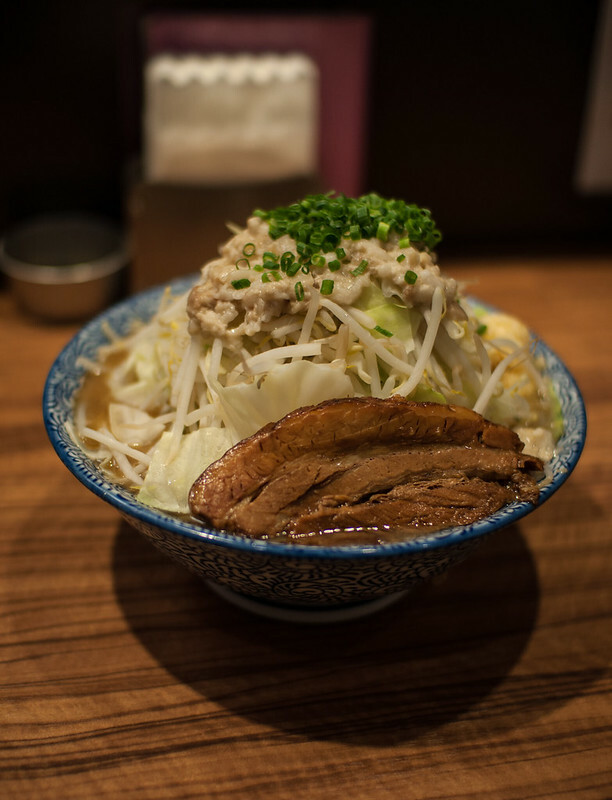 Completely infused with whatever soy sauce mixture they cooked it in, this chashu falls apart with the slightest touch of your chopsticks. But wait, there's more. The shop is known for another meat topping; steak! For a few hundred yen more, you can get an entire steak to go with your ramen. Arteries be damned! Another plus here at Toro is that you can get a mini size bowl. 150g of noodles is hardly mini, but considering most Jiro, Jiro-kei, and Jiro-insupai-kei give you at least 300g, this is a big point for those with normal size appetites. I've eaten a lot of Jiro style, and I always say that I don't like it, but then recommend the shop anyways. Just realize that this is an intense style of ramen that would probably be a huge hit in any college town in America, if it weren't for all the health code violations.